Joseph Aviram, 97, has lived through many exciting years of biblical archaeology in the land of Israel. Nir Hasson looks at the history through his eyes in an article in the Weekend magazine. Aviram declines to say more. Nor is he eager to talk about the “wars of the archaeologists,” which began in the 1970s. The most heated dispute of all continues to simmer today, at one level or another: It was between Yadin, as the representative of the biblical approach − those who find evidence for the Bible narrative in excavations − and the critical approach, which finds mainly contradictions between archaeological finds and the Scriptures. Last week we provided a brief history of the American Colony and G. Eric Matson. 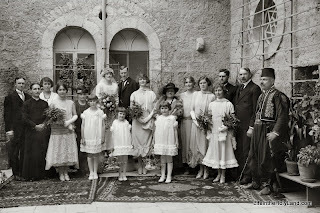 Before we move to the next collection in the Historic Views of the Holy Land series, there is one other story about the American Colony that I have to share. The final approach of the British forces to Jerusalem, in December 1917, and the subsequent surrender of the city, involved American Colony personnel in a number of curious and fascinating ways. For one, it gave rise to perhaps the most memorable of all American Colony photographs, that of the "first" surrender—by some counts there were as many as five!—of the city of Jerusalem in World War I. By the morning of December 9th Turkish army units had completely withdrawn from Jerusalem and the Turkish governor, Izzat Pasha, fleeing shortly before dawn (in a horse-drawn carriage borrowed from the Colony! ), left in the hands of the mayor a letter of formal surrender, including an order that not a shot was to be fired in the city‘s defense. 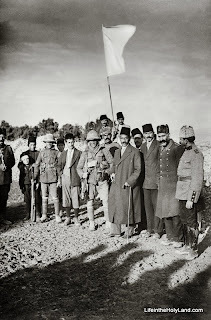 Thus, that Sunday morning the city‘s Arab mayor, Hassain Effendi al-Husseini, armed with the Pasha‘s letter of capitulation, set out to turn the city over to the British. On his way he first stopped to inform his close neighbors at the American Colony, where he had once been a student and was still a frequent visitor. Stopping first at the Big House he encountered Lewis and Edith Larsson, then proceeded to the nearby Vester house where his good friend Anna Spafford was then in residence. In the meantime, Larsson grabbed his camera, his three-year-old son, and a young assistant and hurried to join the mayor‘s growing group in Jaffa Road. In the process, someone from the American Colony—accounts differ as to who—fashioned the requisite white flag of surrender: a bed-sheet from one of the Colony-run hospitals nailed to a broomstick. Larsson also managed to save the makeshift truce flag, which eventually found its way to the Imperial War Museum in London. Quotation from Tom Powers, "Jerusalem's American Colony and Its Photographic Legacy," (essay included in The American Colony and Eric Matson Collection, 2009), pp. 35-36, 38. This photo and over 400 others are included in Volume 7 of The American Colony and Eric Matson Collection, and can be purchased here with free shipping. For more information on the surrender of Jerusalem, see my previous post here. Recently, I sat down in the early morning to enjoy a cup of coffee and my newspaper. The headline of the Jerusalem Post read “Swarm of Locusts Crosses Sinai Border into Israel”. I leaped out of my chair, grabbed my camera gear, jumped in my car and raced towards the Egyptian border. Within three hours locusts were bouncing off my windshield! The estimated swarm of 120 million had been devastating Egypt for several days, but Israel was ready for them with pesticide-loaded planes and helicopters. So, while I didn’t get to see them in their full force, it was yet another experience in Israel that brought the pages of the Bible to life! I will never forget seeing these locusts carried in on the wind, eating everything in their path. Click here to watch the 2-minute video. Jewish groups held a mock Passover sacrifice on Thursday opposite the Temple Mount in Jerusalem. The ritual slaughter was not merely a historic reenactment, but, they say, practice in advance of the reconstruction of the Temple. The full story includes a one-minute amateur video. Another video from a similar service several years ago was produced by SourceFlix. 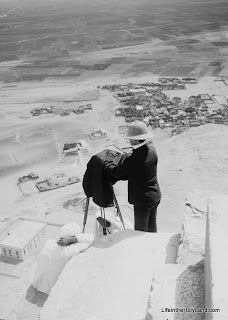 Our picture of the week captures the essence of the time when the British ruled over the Holy Land. I'm not referring to the Crusades (although that is a fascinating period as well), but rather the time of Britain's successful military campaign in Palestine during World War I and the British Mandate period which followed. From 1917 to 1948, the British maintained control over the territory of Palestine ... or at least they did the best they could to maintain control over a quarrelsome local population. The photograph comes from Volume 7 of the American Colony and Eric Matson Collection, which focuses on early 20th century history. This volume is described in the following way on LifeinthHolyLand.com: "This CD includes more than 400 selected photographs of important figures and events from the pre-1948 history of Palestine, including the visit of Kaiser Wilhelm to Jerusalem (1898), the surrender of Jerusalem (1917), the Arab Riots (1920s), the founding of Hebrew University (1925), and Zionist projects in Palestine." Several photos from the collection can be seen here. It is an invaluable collection for anyone interested in this formative period of Israel and Palestine's history. 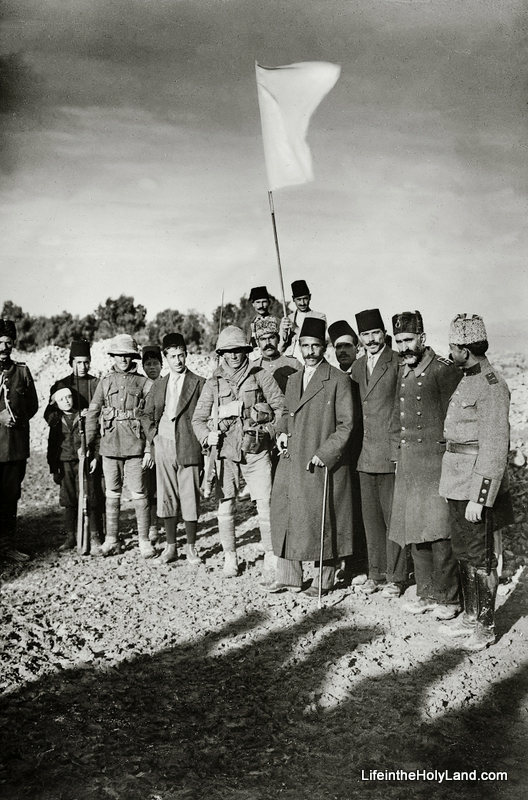 The photograph was taken shortly after the surrender of Jerusalem in 1917. 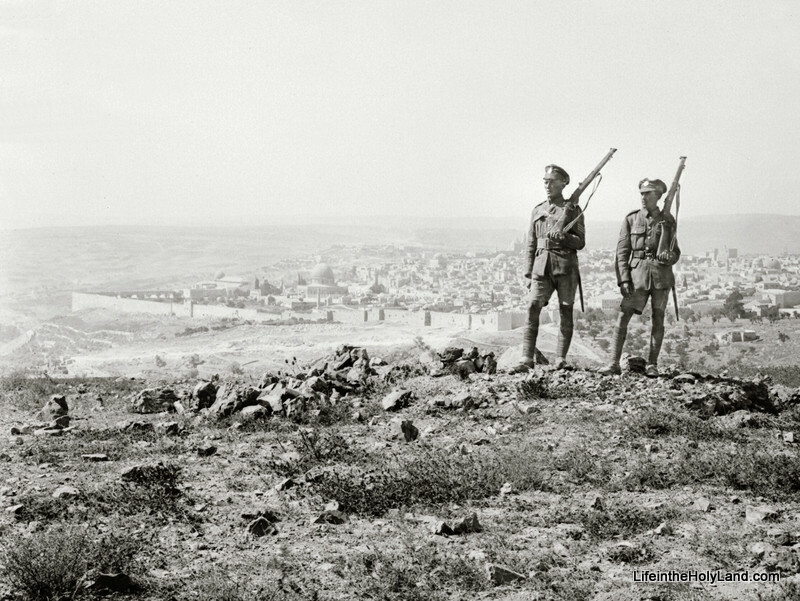 Two British sergeants armed with rifles are standing on Mount Scopus with the Old City of Jerusalem in the background. Through the haze you can see the city walls and the Dome of the Rock. For the next 30 years, scenes like this would be common in Palestine: the British keeping watch over the holy sites and the local population. Thus began a 30-year period when the British controlled the Holy Land. This picture and over 400 others are included in Volume 7 of the American Colony and Eric Matson Collection, and can be purchased here for $15 (with free shipping). 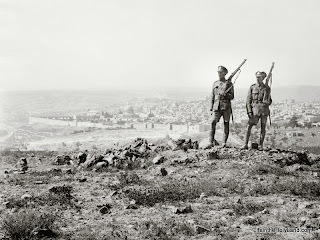 A photograph of Allenby's entrance into Jerusalem is available here on LifeintheHolyLand.com, and a photo of German prisoners of war entering Jerusalem in 1917 is available here. The Times of Israel recommends five places to visit on your next trip to Jaffa (Joppa). National Geographic is calling all adventurers and explorers for a new adventure series. Yes, locusts are kosher. They’re apparently good pickled, dried, smoked, boiled, roasted, barbecue grilled, fried, and stir fried. No, locusts are not kosher. The problem is that the biblical locust may not be the same as the modern ones. In an op-ed at the Los Angeles Times, John J. Collins provides a brief history of controversy surrounding the Dead Sea Scrolls and concludes with a summary of why the scrolls are important. Eisenbrauns’ Deal of the Weekend is Ugarit at Seventy-Five, edited by K. Lawson Younger Jr. (Reg. $39.50; now $15.80). ASOR’s Archaeology Weekly Roundup links to 14 other stories. Over the last few days, swarms of locusts have threatened Israel and Egypt. The Egyptian swarm was estimated to be at least 30 million insects, while the swarm that entered Israel was only about 1 million. In 1915, a similar locust swarm wreaked havoc in Palestine, and photographers and scientists had one of their first opportunities to study these insects up close. Digging up the eggs before they hatched. Setting up long lines of metal sheets and directing the locusts to pits in the ground where the locusts would be squashed (by men holding their noses) and then buried. Poisoning them by adding arsenic to grain and spreading the grain in their path. Using a flame thrower to burn the insects while they ate the vegetation. One evening while trapping them on the upper side of the hill we learned just in time that an immense number were just about to enter the property from the opposite side. 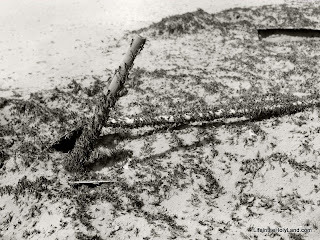 At once all efforts turned in this direction, and the trap was sunk into the lower edge of the field toward which they were making; but no sooner had it been set in place than the locusts again changed their course. Notwithstanding the laborious task involved, the trap had to be moved, during which process it was nip and tuck to keep the locusts from escaping. 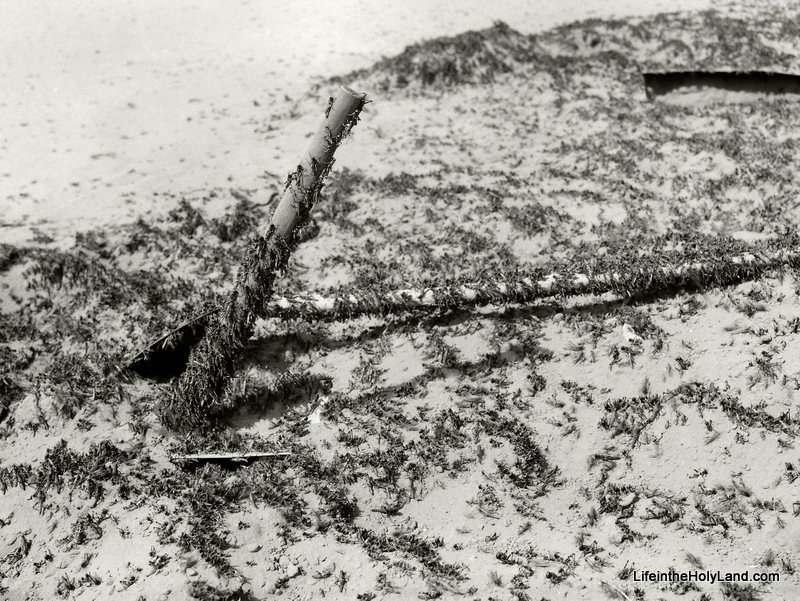 Once, however, they made in the right direction, they jumped, hundreds at a time, into this death trap. The evening hours were now upon us; the locusts, weary from being driven and benumbed from the cool breezes, seemed to near the trap exhausted, while those behind kept piling up till the earth for a small space was covered layers deep. To facilitate matters, with spade and rake they were scraped into the trap, now constantly being emptied. By way of contrast, this week the Israeli authorities were able to eliminate a swarm of locusts by spraying pesticides over thousands of acres in a single day. One hundred years of developments in technology can go a long way. This photograph and over 600 other images of "Traditional Life and Customs" are available in Volume 6 of The American Colony and Eric Matson Collection and can be purchased here for $20 (with free shipping). See here for another photograph of the crawling locust in this collection, and see here for a previous post on this locust plague with two additional pictures. Classroom learning is valuable, but experience in the field is essential for students aspiring to careers in archaeology and ancient Near Eastern history. The costs for even a short summer excavation can be prohibitive for many students, and thus ASOR is sponsoring March Fellowship Madness in an effort to raise $10,000. This is a great opportunity to help needy students in a worthy effort. ASOR has pledged that 100% of all gifts will go directly to the scholarships, and if the goals of 100 donors and $10,000 are met, an additional $5,000 will be donated. You can read all of the details and donate at the ASOR site. If half of this blog’s readers donated $25 each, they would more than double their goal today and 30 students would receive scholarships.